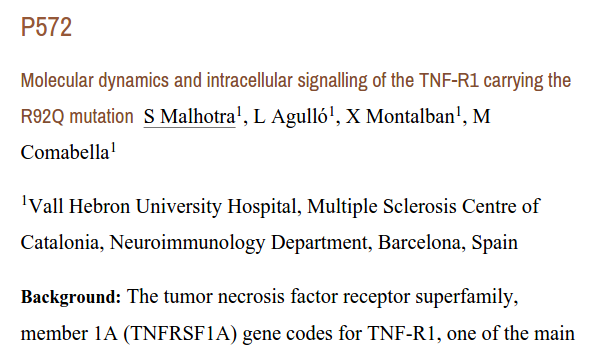 Sunny Malhotra has presented the poster Molecular dynamics and intracellular signalling of the TNF-R1 carrying the R92Q mutation at the annual meeting of the European Committee for Treatment and Research in Multiple Sclerosis (ECTRIMS). This communication shows the last results of our investigation on the effects of the R92Q mutation on the behavior of the TNF type I receptor. This entry was posted in Scientific meetings and tagged autoimmune disease, multiple esclerosis, neurology, PCR, R92Q mutation, TNF receptor. Bookmark the permalink.